Actun Chapat: Update 1 "Maya Caves of West-Central Belize"
Josalyn Ferguson, supervisor of excavations at Actun Chapat, points out the remains of a wall built by the ancient Maya. Following the 1999 research, investigations conducted within Actun Chapat during the 2000 field season continued to examine architecture, but moved to Chamber 3B, an area approximately 120 meters from Entrance I, but within the dark zone of the site. While the number and types of architecture within this area are far fewer than in Entrance II, it was important to test this area (the second of three known to contain architecture within Actun Chapat), in an attempt to comprehend the nature and purpose of architecture within this cave. Chamber 3B is at the southern-most extreme of a large chamber (3) and is marked off by the wall of the cave and large concentrations of breakdown measuring approximately 20 by 15 meters. Interestingly, the area is further differentiated from the rest of Chamber 3 in that the ground surface does not exhibit the ankle-breaking scattering of cave rocks that the rest of the chamber does. We believe that the Maya purposely cleared all debris from this area and used the cleared rocks and speleothems as construction material in the seven terraces within Chamber 3B and the two walls that close off the entrance to Chamber 4 at the southwestern end of the chamber. Clearing the debris would have also made it easier for activities to take place in this area. As with the terraces in Entrance II, there is no evidence to suggest that the Maya were modifying any of the construction materials--making cut blocks or plastering and painting the rocks--as is typical of surface site construction. Instead, it was evidently important to have the architecture maintain a cave appearance rather than exhibit a tailored appearance typical of architecture at surface sites, hence the use of existing cave formations within these constructions. Of further mention, four of the terraces and the area immediate to the cave wall near Chamber 4, all had dense concentrations of sooty ash with charcoal flecks and pieces interspersed throughout along the cave wall. It appears as though this ash was swept to the edges, leaving the majority of these areas free from the debris associated with some sort of burning activity. The central, low and flat area of Chamber 3B also exhibits areas with high concentrations of ash. Unfortunately, Chamber 3B has been subject to the same looting activities as Entrance II. We have found more than five looter's pits. Because of time constraints, and unforeseen difficulties working in the complete dark zone with apprentice excavators, only three units were placed in Chamber 3B. All excavation units were 1x1m test units, were excavated with trowels, geological picks, and whisk brooms, and were screened through 1/4 inch screens, unless the matrix from the entire level was collection for flotation. All units were excavated by cultural and natural levels. Unit 10 was placed on the highest and most western of the terraces in Chamber 3B in an area void of looter's pits. A dense lens of ash at surface prompted our placement of the unit. Very few artifacts were recovered--a total of 36 ceramics were unearthed for the entire unit. 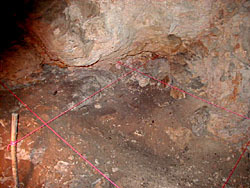 The stratigraphy in Unit 10 was marked by a series of burning and ash episodes, however the matrices were mostly concentrated in the northeastern corner. The rest of the unit was very difficult to excavate clearly, because of melding of strata. Some levels were not detected in all areas of the unit. A stain of a burnt piece of wood was collected from Level 5. 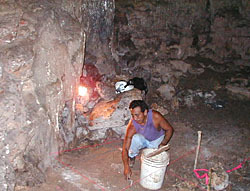 Excavation was terminated when sterile, natural cave deposits were reached. Unit 11 was placed on a north-south axis after faunal remains, including reptile and burnt bone, was collected from the exposed matrix associated with a looter's pit. The placement of the unit along a north-south axis allowed us to conduct a salvage excavation of this material, and also test the highest and most eastern of the terraces in Chamber 3B. Additionally, Terrace 26 is the smallest of the terraces. Unfortunately, as we discovered, looters had destroyed most of the terrace wall. A plaster floor went underneath the wall in the northern section of the unit, and deteriorated along the western wall of the unit. Like Unit 10, very few artifacts were recovered from Unit 11 (11 ceramic sherds in total), and not all levels were detected throughout the unit. A small, drilled conch shell (likely an ornament) was retrieved from Level 6 on the floor. The first two levels were disturbed from looting activities. A charcoal "pit" was discovered along the eastern wall of the unit in Level 4, but charcoal was present throughout all stratigraphic levels. Unit 12 was placed along a north-south axis just to the east of the second entrance to the walled-off chamber (Chamber 4, where Wall 4 is located), adjacent to the southern wall of Chamber 3. The area was void of looting activity and the unit was placed so to partially fall in front of the entrance, and hence wall of the walled off chamber. While this unit did not test the architecture directly, we felt its placement could potentially lead to an understanding of the wall. Ash was also visible in this area. Burning was detected in this unit in the form of charcoal surfaces, oxidized matrices of a deep, homogenous red color, as well as dispersed ash and charcoal. Because of its relative location to the central area of the chamber, and the large cluster of surface ceramics immediately to its north, the number of artifacts recovered from Unit 12 and its extension were higher than the other units (we recovered 104 ceramic sherds from this unit). We decided to expand the unit to fully explore a "pit" of loose dirt and concentration of ceramics in the wall. 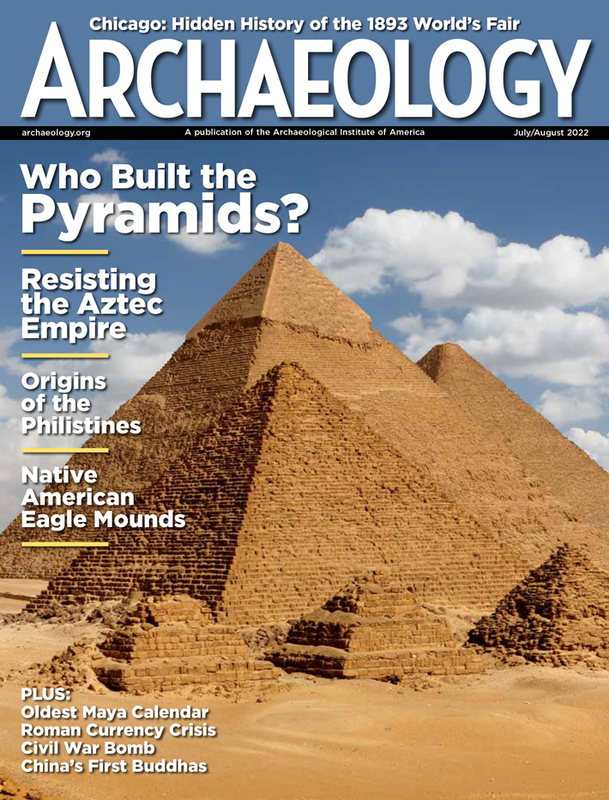 Only 49 ceramic sherds were recovered, but because of its relative density it was designated contextually as a cache. Local excavator Jim Puc works in Unit 12. We also conducted surface collection of many areas within the chamber. These surface collections were undertaken, in part, because of the fact that so few ceramics, diagnostic or otherwise, were recovered from excavation units. Since the ceramics on the surface far out number those being found through excavations, this will at least provide us with a very general chronology of use for Chamber 3B. The materials retrieved through surface collections allow us to examine correlations with ceramic types and time periods with that which might have been realized through excavation data. The architecture in Chamber 3B was not as extravagant or high as that in Entrance II. This was potentially because of the darkness of the area, and hence the Maya's difficulty in constructing more elaborate or high terraces. It may also have to do with the area itself being less steep and thus not requiring as high or as wide constructions. While burning was evident on some of the terraces within Entrance II area, it would appear that the activities associated with the terraces in Chamber 3B involved more regular burning. Similar to the Entrance II constructions, few artifacts were recovered from within the construction fill of the terraces, and that collected in surface collections was much more numerous. 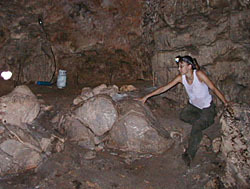 This is typical of other caves investigated by the WBRCP. 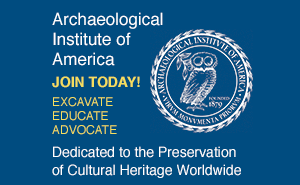 Investigations conducted at Actun Chapat will ultimately contribute to ongoing investigations by the WBRCP concerning the temporal, social, regional and differential use of caves by the Precolumbian Maya of western Belize.